The RENEGADE 300 ZTR is truly an All Terrain - All Season Vehicle. As a track driven vehicle, the Renegade provides superior traction in all types of terrain and conditions that cannot be matched by wheel type vehicles. It has over 2,500 sq. inches of track surface, ensuring a ground pressure between .66 and .94 psi, minimizing any soil disturbance while maintaining excellent traction. Our steel belted, endless rubber track has a very aggressive tread design, further ensuring pulling power when you need it. A durable, industrial 32 horsepower (992 cc), 4 cycle, air cooled, OHV V-Twin engine with full pressure lubrication and a 3,000 hour life, coupled to a rugged transmission employing dual Sauer/Danfoss hydrostatic drives, provide the power to transport people and cargo to areas that wheeled vehicles fail to go. A clutch mechanism ensures easy starts in cold weather equating to longer starter life and allowing proper warm-up. A single T-handle provides for turning and braking as well as determining the vehicle's forward and reverse speed. Simple one handed operation makes it a pleasure to drive and reduces operator fatigue. 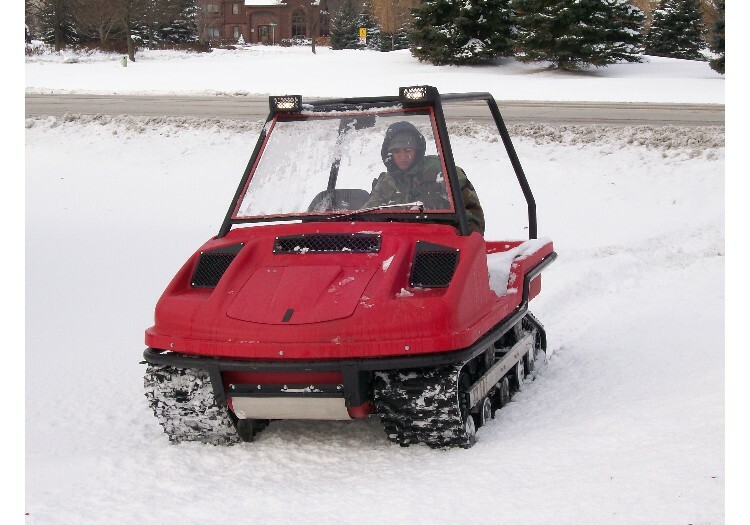 The uses for the RENEGADE are endless, varying from utility, pipeline, and transmitter tower service crews to fire and police patrol, ski and safety patrol, conservation and forestry operations, surveyors, real estate sales and construction operators. It is great on the ranch or farm for all those chores including snow removal, and sportsmen love it for hunting, fishing or just getting away. While designed as a serious work vehicle, it gets you where you want to go after hours too. We have encountered many conditions in our testing, which varied from 95 degree summertime to well below zero wintertime, from sea level to over 9,000 feet in the mountains of Montana and Utah, from woods to swamp and from construction site to asphalt parking lot. With more than two and a half years of testing, we are pleased and proud of the Renegade's performance.